This level has medium difficulty. 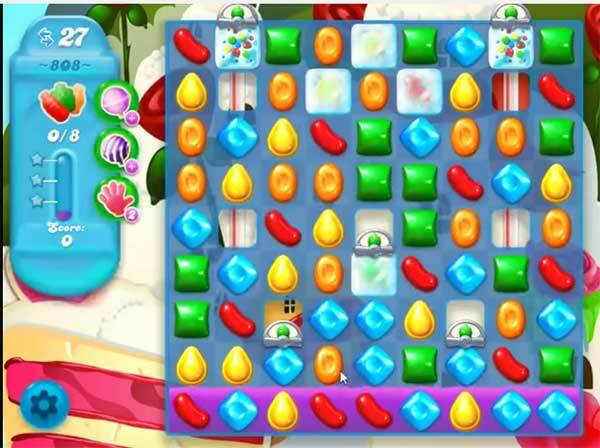 For this level try to play where you have more same color candies or play from top of the soda or bottom of the board to shuffle the candies. That will help to give more chances to make special candy. Combine them with each other to break the soda bottles. Not cool!!! I’ve never seen more than 3 bottles in this level! Not having much luck getting bottles to even appear! Combined 2 color bombs & that didn’t even reveal a bomb! This level su***. Like everyone else, bottles don’t drop. So far only 3 unless boosters are used , cash grab? Wtf is there a combo needed to release these dam bottles? Always dumb instructions. I don’t get where the bottles are. If they only drop from the spigots, it’s rarely and not nearly enough. Guess it’s going to be one of those where you just keep playing and then suddenly a miracle happens. Should be some kind of strategy but beyond me. What’s the secret to this level? I can get 6 bottles, but the rest never show up. This one is really awful because all your moves are used up getting 3 or 4 bottles, most come from the top but it takes too many moves to unblock them, over and over it’s the same result very aggravating to say the least. Can’t see any way of winning this, by the time I clear the top there are only about 5 moves left so I usually get about 3 bottles sometimes 1, it often comes from 2 free hours where you have a few very easy games and then one that will last a week because it’s impossible, why can’t it be more consistent then it wouldn’t get so boring because it is BORING. Can’t figure out how to get the bottles out. There is never any feedback from this comment. Have watched the video and read tips and still nothing !!! Cannot get anywhere with this level at all, there are not enough moves to get bottles from the bottom and top, by the time I have broken the layers I am out of moves. If I win it , it will not be from any strategy because it’s mindless, the bottles are there sometimes and not others. This level needs to be changed because it’s extremely boring, getting 4 maybe 5 at most.